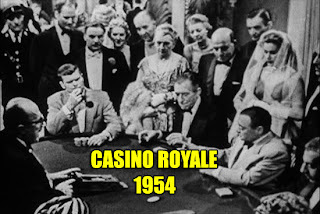 Only two years from the debut of Ian Fleming’s James Bond in his novel Casino Royale, the British secret agent made his live action debut….on an American television program. CBS’ Climax featured an hour-long adaptation of the Flemings story and introduced television audiences to James Bond 007 – or as he’s referred to in the program Jimmy Bond, who is now an American agent played by Barry Nelson. With this program Nelson would have the distinction of being the first actor to play Flemings Bond character. Although Sean Connery would often be considered the first James Bond. General audiences aren’t that familiar with the program and most probably don’t even know it exists! But it does exist in all its black and white, grainy glory. The role of the villainous Le Chiffre is played by famous character actor Peter Lorre and the first Bond girl Valerie Mathis is played by gorgeous bombshell Linda Christian. We also get to see Bond’s ally Clarence Leiter (they changed his name from Felix for some reason) who’s played by Michael Pate. Fans of the novel will notice a lot of changes to the story and characters, but the basics are essentially the same. James Bond must win a card game against Le Chiffre to stop him from continuing his evil ways. The stakes and risks Bond must take are high as Le Chiffre has every intention of winning at any cost. 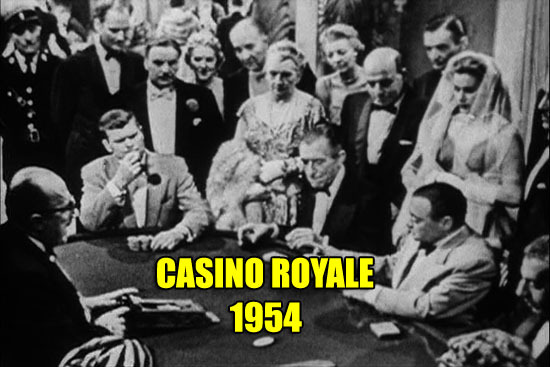 So, is the 1954 adaptation of Casino Royale worth a watch? Here’s my review. When CBS rang Barry Nelson about the James Bond role, the future first ever James Bond to be was actually in Jamaica when he got the call, Jamaica was the home of James Bond creator Ian Fleming who wrote all the James Bond novels at his 'Goldeneye' resort in Jamaica. In an interview with Entertainment Tonight during 1987, Barry Nelson said he had been working on a CBS TV series called My Favorite Husband when he received a rushed telephone call from CBS who were in a bit of trouble casting the show, Nelson said that he had not read the original "Casino Royale" novel at the time and the James Bond phenomena was not a big thing in those days, he added that he modestly did the best he could and only considered himself to be a Double-O One and a Half. Barry Nelson has said that his main impetus for taking the role was the opportunity to work with legendary actor Peter Lorre, Nelson had been a fan of the actor's great body of work and believed that if he didn't take this opportunity to work with him here it may not present itself again. Just before the show went to air, the producers discovered that the live performance would run three minutes over its allotted running time, in haste, lines, part-lines and words were cut to bring the running time down. In an interview with Starlog Magazine in October 1983, Barry Nelson said: "So they went through and cut three words here, a line there, a half-a-word here, and their script ended up looking like a bad case of tic-tac-toe, I tell you it was so frightening that when I entered my only thought was, 'Oh, God, if I can only get out of this mother!'. I was very dissatisfied with the part, I thought they wrote it poorly. No charm or character or anything." Peter Lorre played arch-villain Le Chiffre and acted opposite a worried Nelson, due to the last minute script-changes, apparently Lorre said to the panic-stricken Nelson, "Straighten up, Barry, so I can kill you!". The first public screening of the tele-movie in a theater was held in July 1981 not long after it was re-discovered by Jim Shoenberger, it played at a Los Angeles James Bond Weekend where the telemovie's James Bond star Barry Nelson was in attendance, a luncheon and trivia marathon were also held in conjunction with the film event.